Nneka and Chidi, two children of a Nigerian village, play a game called Colors. 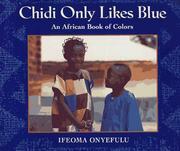 Chidi only likes the color blue, so Nneka shows him all the other colors in the village. She shows Chidi how beautiful and colorful their African lifestyle is. The colors yellow, pink, red, gold are seen, but Chidi only likes blue best of all! Onyefuln, Ifeoma, “Chidi only likes blue: An african book of colors,” Children's Picture Book Database at Miami University, accessed April 23, 2019, https://dlp.lib.miamioh.edu/picturebook/items/show/6306.